Alexander Povetkin: Kostya Tszyu doesn’t want a new fighter! The fight for the WBA World Heavyweight Championship is getting closer. On September 29, defending champion Alexander Povetkin (24-0, 16 KOs) and mandatory challenger Hasim Rahman (50-7-2, 41 KOs) will battle it out at the Sporthalle Hamburg, Germany. Since his last bout against Marco Huck, a lot has changed for team Povetkin. With ring legend Kostya Tszyu he has someone in his corner, who will help him to exploit his full potential. In the following interview Povetkin talks about his new training and his next opponent Hasim Rahman. Alexander Povetkin, your last fight against Marco Huck was seven months ago. A lot has been said since then. Now that you had time to reflect, what are your thoughts on that topic? Alexander Povetkin: It was a hard and tough battle, and both of us had to go to the limits of our capacity. However, in the end I beat Marco as I landed the more precise punches than him. What lessons did you learn from this extremely close fight? Alexander Povetkin: Of course, I learned a lot from that fight. My team and I know what we have to do to prepare myself in order to be better than last time. For example, we have worked a lot on my stamina during my current preparations. Your next opponent Hasim Rahman already was a world champion. He stood inside the ring on 60 occasions and fought the likes of Evander Holyfield, Lennox Lewis and Wladimir Klitschko. What are your thoughts on him? Alexander Povetkin: He should not be underestimated, that’s for sure. If he comes to the ring in good shape on September 29, and I am sure he will be, then he’s going to be a real challenge for me. Will Rahman’s experience be an advantage for him? Alexander Povetkin: He is somebody, who can change the outcome of a fight with just one punch. Therefore, I have to stay really focussed against him. Experience is always an advantage and might help him against me. So I have to be prepared for all possibilities. You are currently training in Moscow. How is your training camp going? Alexander Povetkin: Everything is fine and we are training in a state-of-the-art gym. We have a lot of useful sparring partners. Everything is perfect and as it should be. Over the last few months, you have been working with your new coach, Kostya Tszyu. How satisfied are you with him? Alexander Povetkin: I feel privileged to be working with him. He was an excellent boxer and now he is an excellent coach. I have learned a lot from him. So will we see a “new” Alexander Povetkin when you step into the ring come September 29? 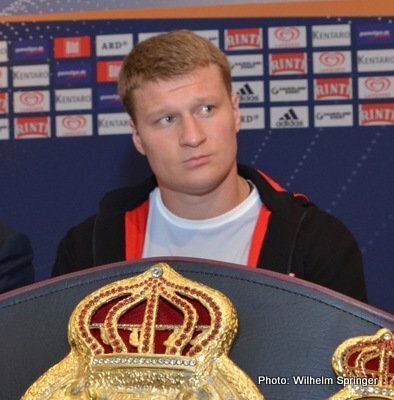 Alexander Povetkin: No, that will not be the case. Kostya Tszyu doesn´t want a new fighter, as it isn’t necessary. We want to improve aspects that I am already good at. We also working on my weaknesses as well and want to wipe them out. Altogether, I will be a more complete boxer trough our work inside the gym. Finally, how is your fight against Rahman going to end? Will it be a fight over twelve rounds or less? Alexander Povetkin: You can’t foresee what will happen and I don’t like giving such statements ahead of a fight. I just know one thing for sure: I will be one hundred percent for that bout and will do my best to be the one standing tall when everything is said and done. It doesn’t matter if it will go for twelve rounds or if it will end prematurely. The main thing is me keeping my belt. Previous boxing news: Has Canelo Alvarez arrived? You are here: Home / Boxing Interviews / Alexander Povetkin: Kostya Tszyu doesn’t want a new fighter!